I’ve been going on a googling search frenzy to find out more about the Battle of Tabuk which happened in Rajab. Surah Al-Tawbah (Bara’ah), the 9th surah of the Qu’ran, tells us the majority of what we know about the Battle of Tabuk and the lessons to be learned from it in verses 30-129. Surah Al Tawbah is the only surah in which the prefix “Bismillah ir Rahman ir Rahim” is not prefixed. In high school, I used to believe that it did not have the bismillah prefix because I thought Allah was mad (given the main theme of Surah Al-Tawbah is about war and those who turn their backs on the Muslims). Yet, now I am viewing it more as a kind of a continuation of Surah 8, An Anfal, which speaks to the lessons and policies of war, and perhaps this is why the surah does not have a prefix. Nevertheless, Surah Al-Tawbah is among one of the last Surahs revealed, and there is a lot to learn from it in a world that deems a “clash of civilizations” a scapegoat. I believe that Allah must really love the Palestinians, because He, azza wa jal, tests those He loves the most. The Palestinians, along with many other indigenous and minority groups in the world, are suffering exile and striving to live, let alone survive. The Jews, at several points in history, were also in exile and persecuted for their beliefs. The sad thing is these brothers and sisters in faith, these ancestral Semetic cousins have forgotten how alike and how intertwined their histories are. And so have all of us. We have forgotten what it means to be human. There is no clash of civilizations. There is only a clash of hearts, a clash of wills, a clash of greedy humans fighting for essentially the same things. Love. Honor. Wealth. Resources. Space. We all have to live somewhere and some place. Why then has there not been a massive reconciliation? Why isn’t their world peace? Because people will always be people. And people are never satisfied. Self-sacrifice is the source of redemption and this is a message clear amongst all of the Books. This is the original Law of Moses and Gospel of Jesus (peace be upon them both). There can’t be any salvation without some effort on our part. In the words of Abdullah Yusuf Ali in his commentary of the Qur’an, “It is our self-surrender that counts, not other people’s merits.” Yet, the way in which we surrender is what makes us all different. It’s what makes a Christian a Christan, and a Muslim a Muslim. It’s what makes a terrorist a terrorist. And I really do hate to use the “t” word. Surahs 8 and 9 are the surahs that many people use and misinterpret to propogate the idea that Islam is a religion of violence. But it is not so. Surah Al Tawbah is a reaction to pagans who broke their treaties and alliances with the Muslims and whose actions went beyond all bounds, not those who didn’t break their treaties. It gave Muslims permission to fight those who were fighting them. Even then, Allah emphasizes an ‘iddah, or waiting period, of four months, for those who are in error to repent and mend their ways. If they did so, then the alliance could continue. But, in this case, the Pagans recurringly violated their oaths and covenant when it suited them, while the Muslims always upheld their end. It was an unfair and unjust arrangement. The pagans were hypocrites, having two faces. This surah shows us that the Prophet Muhammad (peace and blessings be upon him) interacted with and had treaties and alliances with Christians, Jews, and pagans. So what is the problem nowadays between Muslims and non-Muslims? And what does it have to do with the Battle of Tabuk? The Battle of Tabuk was in the late summer of A.H. 9, in the month of Rajab. This is about the year 630, in October, but Allah knows best. Tabuk is near what was then Byzantine/Roman territory. It is in the land of Al-Shams, the Levant, which was the Province of Syria that included Palestine. It is about 350 miles northwest of Madinah, and 150 miles south of Ma’an. It’s on the frontier of Arabia. There were rumors that the Byzantines/Romans were preparing to invade Arabia and that the Byzantine Emperor had arrived near the frontier himself for this purpose, so the Prophet (saws) marched to Tabuk with as large as a force as he could collect at that time. Well, the Byzantine/Roman invasion did not occur. Instead, the Prophet (saws) was able to make treaties of alliance with certain Christian and Jewish tribes near the Gulf of ‘Aqabah. He (saws) was able to bring the land of Al-Shams under the fold of Islam. So a would-be war actually became a diplomatic mission of peace in the Levant, unifying some Christians, Muslims, Jews, and pagans. This is the lesson of the Battle of Tabuk. And it makes me yearn for the days of covivencia of Christians, Jews, and Muslims in the Middle Ages that was present in Spain, Morocco, and yes, even, Jerusalem. Yet, I fear that they’ll never come again. As time goes on, and people and civilizations advance even more, we are evolving into less humane beings and more human beings. When people ask me to define Islam, I do not just say “submission to the will of Allah”. It is “submission and complete surrender to the will of the Source and Sustainer of Peace”. Islam derives from a particular attribute of Allah, one of His Most Beautiful Names, Al-Salaam, which is deeper than just the mere word, “Peace”. It means that Islam and Allah is the source of security, stability, and safety. When you wish someone peace, it means that you will not harm them. Ponder this for a while. Common Christian belief would have you believe that redemption can be achieved through another’s suffering for their sins. An extremist in any religion would have you believe that redemption can be achieved by creating a mass suffering of others—those deemed “the bad guys”. Yet, our self-surrender can entail many different things. Surrendering is not just a term of war. Surrendering is a term of peace. To surrender is to be at peace. The name of this surah means repentance. I think we all could use a little repentance. No one is perfect. It is all to easy in this world to play the complacency card, and look the other way as if we don’t know what is happening. It is also too easy to blame “the other”. Let us try blaming ourselves. What have we done to provide a solution? On another note, Surah al Tawbah has led me to my next destination post-Jerusalem insh’Allah: The Mosque of Piety/Masjid Al Taqwa in Quba, the Quwat al Islam/Mosque of the Power of Islam in Saudi Arabia. This masjid is mentioned in verse 9:108, and is the first “mosque” of Islam as we define them today. This is the fourth holiest place in Islam, and it was built before the Masjid An-Nabi in Madinah. This is the mosque where the Prophet Muhammad (saws) went to before entering Madinah on Hijrah. He rested in this town, Quba, for four days. 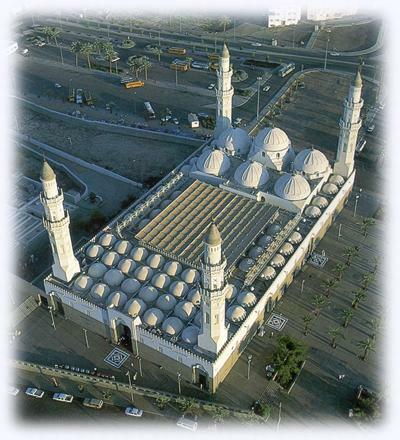 The masjid still stands today, and is called Masjid Al Quba. Let us all purify our hearts to be of those who truly surrender.